You know Gaga, making sure that everywhere she goes will get our attention. Lady Gaga was spotted leaving the Park Hyatt Hotel in Paris last Saturday in an awkward dress. Mother Monster was sported another bizarre fashion of her choice, wearing a large structured pink-and-blue dress, paired with a lace up platform boots and crazy designed sunglasses. While recently gaining weight of 25 pounds it’s no surprise that Lady Gaga will change all her outfit to fit her new body and to somehow hid the excess baggage in her figure. Lady Gaga gained weight over the summer and it’s all because of her love to Italian foods and her Father’s new restaurant. She thanks her fans for embracing her no matter what twitting: "And thanks to my fans, who love me no matter what, and know the meaning of real beauty & compassion. I really love you." Is this a dress or a costume? Lol. I'll never get to figure out Lady Gaga's fashion statement. This makes her look like a mascot. oh my lady gaga will always be ridiculous and i love her for that! Flashy. Bizarre. Effective. 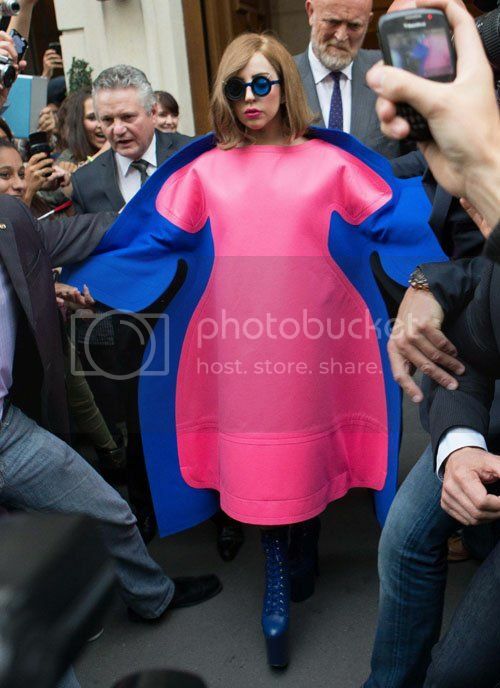 Attention grabbing style of Lady Gaga..should the pink and blue colors be changed with white and black ones, she will look like a penguin. it kind of looks like those paperdoll outfits. she looks like a cartoon character in this outfit.